My line of work involves doing lots of workplace interviews, with little control over ambient noises such as ventilation systems, machinery, traffic, fluorescent light ballasts, and anything else that makes noise in business and industrial environments. The resulting video clips are typically viewed by large audiences using PA systems for sound reinforcement which seems to only amplify all the wrong parts of the audio spectrum. My quest for a fast way to deal with noise led me to SoundSoap. SoundSoap is a product from BIAS, Inc. (maker of Peak and Deck, versions of which are variously packaged with Final Cut Pro and DVD Studio Pro) which claims to make removing noise one-click simple. For $99 it was a no-brainer to order a copy and try it out. My evaluation in a nutshell: SoundSoap works as advertised and belongs in your editing arsenal! As part of a training DVD I am producing I conducted a series of phone interviews, recording them with a phone-line intercept recorder from Radio Shack. This resulted in sound files with a rich variety of audio problems and a really low signal-to-noise ratio to boot. A perfect job for SoundSoap! Below are the original file (normalized but otherwise unprocessed), the SoundSoaped file, and a file containing the noise that was removed. I have no idea how long it would have taken me to produce the same results with a parametric equalizer, expander, and other esoteric techniques. I suspect someone who knew what they were doing could achieve the same results, but this took me less than 2 minutes to complete using SoundSoap! I believe the results are outstanding. 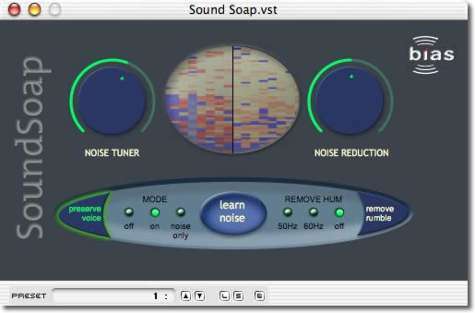 SoundSoap operates in two modes: as a stand-alone application or as a VST Plug-in for applications like Peak and its varients (Peak LE, Peak DV, etc.). Unfortunately SoundSoap will not operate as a plug-in within Final Cut Pro (3 or 4). Both the VST plug-in and stand-alone application modes have essentially the same interface, produce the same results, and can operate on a wide variety of files including your Quicktime capture files. When you're ready to sweeten your audio for a project, you can simplify your workflow by adjusting Final Cut Pro's preferences to designate Peak or the SoundSoap application as the external editor for both audio and video files, then control-clicking each clip you want to edit and selecting "open in editor." This gives you a simple round-trip functionality that comes close to having SoundSoap behave as a Final Cut Pro plug-in. When SoundSoap loads you will instantly hear a reduction in the background noise. Often the initial setting is close to optimal. But the SoundSoap interface makes it easy to hone in on the sounds you are trying to eliminate and preserve the sounds you want to keep. The first step in fine tuning SoundSoap is to help it understand the kind of audio you are processing. I always select "Preserve Voice" as my files are primarily dialog. If you can hear hum (such as a fluorescent ballast) or rumble (really low frequency stuff, sometimes present in large buildings) select the appropriate options. Tip: wear good headphones and turn the volume up to hear the problems. Next you will teach SoundSoap the exact ambient noise you want removed. Locate an approximately 2 second section of ambient noise only and press the "learn noise" button as the file is playing across it. Sound Soap will amplify the noise as it auto-magically learns it. Do not "learn noise" across voices or any audio you want to keep. If you don't have a long enough section of ambient noise just copy and paste quiet sections of your file to create one (do this on a duplicate of your clip - not the original). You will immediately hear the result. Listen closely for distortion, ringing, or unnatural artifacts in the processed sound. If you don't like what you hear, try learning the noise again from a different section. Once you think you are about there, select "noise only" and listen to what will be removed from the audio. Use the big dials to fine tune, alternating between listening to the processed audio and the noise only. When you have the settings you want, be sure to "bounce" the plug-in and disable it, then save (or better yet save-as) the file. If you want to process multiple clips from the same shoot, you can save your settings and instantly re-load them for each clip using the small 'S' and 'L' buttons. This has the added benefit of keeping your audio consistent across multiple clips. There are also advanced options such as using envelopes to control SoundSoap (similar to keyframing effects in FCP). The manual is comprehensive and clearly written. SoundSoap does not really let you peek behind the curtain to see how it achieves its results, but the results speak for themselves. Bad audio devalues even the best video, and SoundSoap can fix most common problems with a minimum of time and fuss. SoundSoap is not only an inexpensive solution, but it is fast and easy enough to use that I process virtually all of my audio through it, resulting in a more polished and professional end product. If you have upgraded to FCP 4, you can try SoundSoap for yourself! A 14-day trial version of SoundSoap is packaged with the Peak Express application on the FCP install DVD. Jim Perry is owner and chief custodian of Business Video Express a media production firm focused on achieving business results through powerful training and communication solutions.